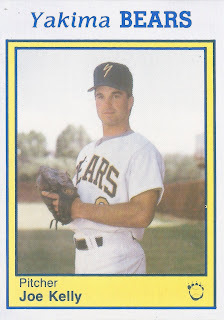 Joe Kelly earned the Georgia Bulldogs' title of most versatile pitcher in 1989, starting in 11 games and relieving in another 11 more, according to The Georgia Bulldog. Kelly picked up two wins and seven losses in those outings. He also picked up a complete game and a save, The Bulldog wrote. The next year, he helped the team on to the College World Series and a title. He also helped himself on to the pros. Kelly, though, proved less versatile there. He played in 17 games, all in relief. Those 17 games marked the extent of his pro time. Kelly's pro career began and ended that year in 1990, signed by the Dodgers as an undrafted free agent out of Georgia. He went there out of Notre Dame High School in Utica, NY. At Georgia, Kelly was a member of both the 1987 and 1990 College World Series squads. He even helped the team at the plate, going 2 for 4 as the designated hitter in the championship game. The Dodgers sent Kelly to short-season Yakima. He gave up one unearned run in two innings of work in an August game. He then gave up two earned in early September over five outs. Overall, Kelly gave up 12 earned in 23.2 innings for a 4.56 ERA in his only season as a pro.